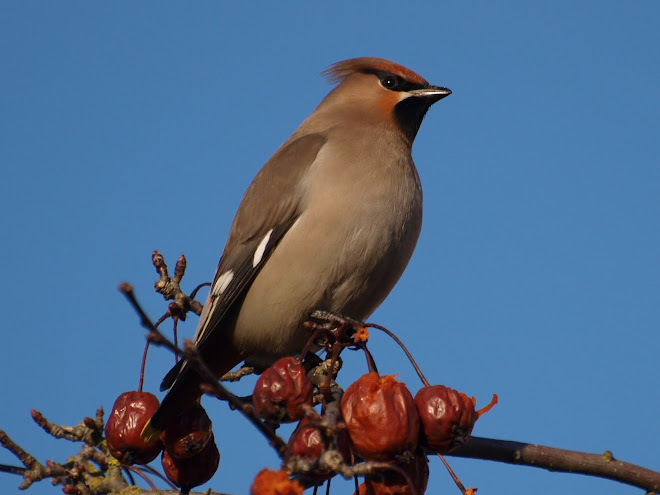 A record of wildlife in my garden and various trips to the Warwickshire countryside and occasionally further afield. Last weekend D and I decided to visit another English Heritage property. Ashby de la Zouche castle is only 30/40 minutes from home and having seen photos of the castle on Rosie's blog "Corners of my Mind" it looked an interesting place to visit. William, Lord Hastings was born around 1430 - he became a favourite of Edward IV and was Chamberlain of England. In 1474 Edward IV gave Lord Hastings a licence to fortify 4 manor houses - Ashby de la Zouche, Kirby Muxloe, Bagworth Hall in Leicestershire and Slingsby in Yorkshire. The licence would also allow him to enclose around 9000 acres of land around the houses to create parks for hunting. The death of Edward IV in 1483 meant the end of Lord Hastings career and as he was seen as an obstacle to the Duke of Gloucester (the future Richard III) he was executed on 13th June, 1483. After the licence to fortify was granted Lord Hastings adapted an existing manor house. He added a new chapel and the two towers that today dominate the ruins. After his execution work on both Ashby and Kirby Muxloe ceased for a while. Kirby (which I hope to visit later in the year) was never finished but Ashby became the main seat of his descendants. The castle was an important Royalist base during the Civil War under the command of Henry Hastings, Lord Loughborough. In 1646 it surrendered and two years later the castle was demolished. Later a few residential buildings which had survived were incorporated into new buildings. In the 19th century it became a popular tourist destination due to its mention in Ivanhoe (1819) written by Sir Walter Scott. The site was repaired by the Ministry of Works between 1911 and 1913 and is now an English Heritage property. The Great Tower was built by Lord Hastings in the 1470's as the centre piece of the castle to show his power and wealth. Before it was demolished in 1648 it would have contained a great chamber where Lord Hastings received guests, a parlour, a withdrawing chamber, a kitchen, and a treasure chamber. It originally had four floors. 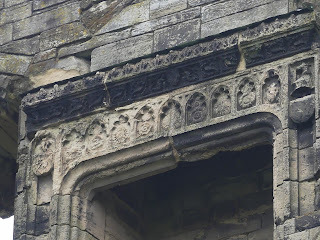 This niche contains heraldic "achievements" of Lord Hastings. You can climb the stairs to the top of the tower. I didn't fancy going up partly because I can't stand heights and partly because these days I don't think my knees are up to it. D, however, has no such problems so here are his photos of the views! Me on the ground a long way below!!!!!! There is an underground tunnel (probably part of the Civil War defences) which leads from the the Great Chamber to the kitchen. This is something I did walk along - very damp, gloomy and spooky! At the end of the tunnel is a 15th century cellar which would have been used to store barrels. Some of the exterior walls contain marks of canon balls from the Civil War. The Inner Court - the 1596 inventory shows that this courtyard contained bed chambers and a great parlour. It was interesting to see the different rates of weathering of some of the stones. The Great Chamber with a 15th century fireplace with a over mantel containing carvings of angels and shields. Remains of several fireplaces can be seen in the walls. The 1596 inventory records that the Great Chamber was hung with tapestries telling "the story of the Romans" This room would have been used to entertain important guests. Remains of the Kitchen Tower. The kitchen would have been large reflecting the size of the household. Above the kitchen was a room which may have been used as a winter parlour. The chapel built by Lord Hastings. After the Reformation the Hastings family became Protestants. Illustration of the altar piece. In the lawns by the castle you can see earthwork remains of parts of the castle grounds probably dating from around 1530. The garden is divided in half by a raised walk way. The remains of two brick towers can be seen which were probably used as banqueting houses to entertain guests. The gardens were once much larger and surrounded by parks. Sorry - rather too many photos! I really enjoyed our visit and it is close enough to return because I would also like to visit the Ashby de la Zouche museum nearby which is closed on Sundays and also the nearby 15th century church of St Helen's which you can see in some of the photos D took from the tower. The only problem is my list of places to re-visit is getting even longer than my list of places to visit!! Rosie - Thanks so much and special thanks for your blog post on the castle which made me realise it was well worth a visit. I spotted you had been to the museum - it sounded good. I think i'd be with you on the ground there!! It always seems a bit of a shame to see such buildings in ruins but on the other hand it's so interesting to see how things were built and all the little nooks and crannies you probably wouldn't see in a normal building! We have ruins of an Abbey - Kirkstall not too far from us, some is fenced off but it's a lovely place to visit and has a museum too. Pam - Thank you. My son is ok with heights but I think even he found it a bit scary! I go jelly legged just looking at his photos. I agree about it being a shame to see places in ruins but in a way they do have an atmosphere all of their own and my son just loves them! Kirkstall Abbey sounds good. Would love to return to Yorkshire one day so will add it to list of places to see! 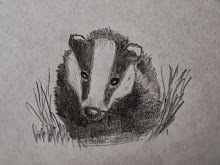 New Government e-petition from Simon King to End the Badger Cull instead of Expanding It Into New Areas. Please click on the image for a link to the petition. Welcome to my blog. I have been interested in natural history from an early age and we have tried to create a garden attractive to wildlife. I also enjoy reading, photography, collecting fossils, visiting historic buildings and gardens and supporting Aston Villa. Please feel free to leave a comment and, if you would like to email me, my email address is ciraggedrobinsATgmail.com - remember to replace AT with @. Thank you for visiting. Vinnyman's Birding and Nature Blog. Birds of Shustoke Reservoir Warwickshire . Welcome to the Plantlife blog. Say GO to the mow! Three Months Later.... Film Release! !